Economics, specifically community-based economics was an early element in Australia’s permaculture movement. Do other organisations stepping into the economics space signify that permaculture is now forsaking it? Where permaculture left-off, others have taken up. That’s the impression coming from the New Economy Network Australia’s (NENA) national conference in Brisbane in September last year and from the conference in Sydney the previous year. Entitled Building a New Economy for Australia, the 2017 Brisbane conference attracted around 350 participants over its three days at the Queensland Library and Griffiths University, both located along the Southbank riverside strip. 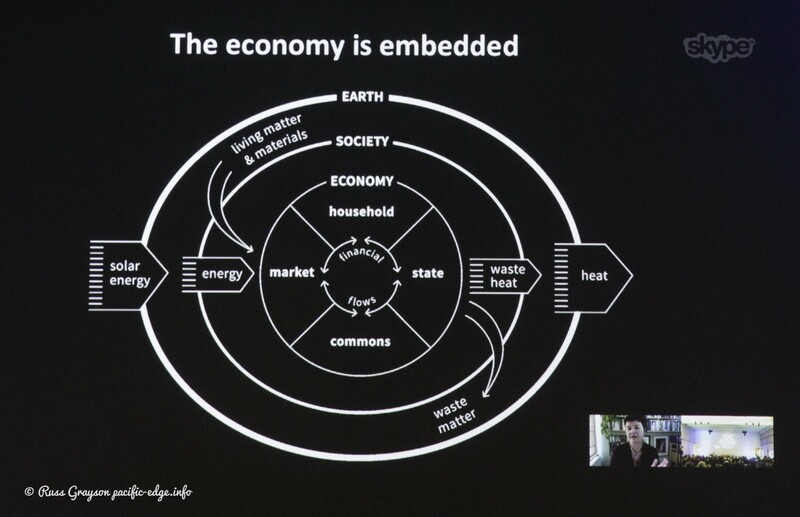 A diagram from UK economust, Kate Raworth‘s book, Donut Economics at the 2017 New Economy Network Australia’s Brisbane conference. What’s this about permaculture leaving-off? In the days when the permaculture design movement was young, there was a strong focus on creating new economic models. 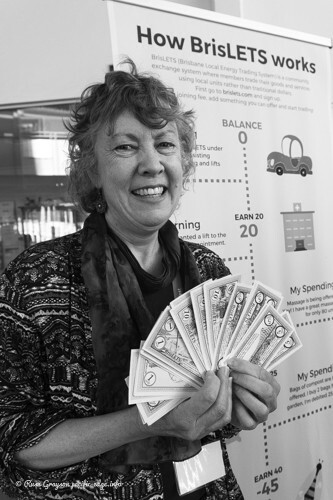 Earthbank (and here), LETS (Local Exchange and Trading System, a cashless social credit system) and ethical or social investment were its main foci. Permaculture at the time did much to popularise and spread LETS, aided by the presence of LETS inventor, the Canadian, Michael Linton, who worked out of Randwick Community Centre in Sydney. There, Michael and his colleagues tried to start SydLETS, what they envisioned would be a metropolitan scale LETS system. It was simply too early for it to take off. 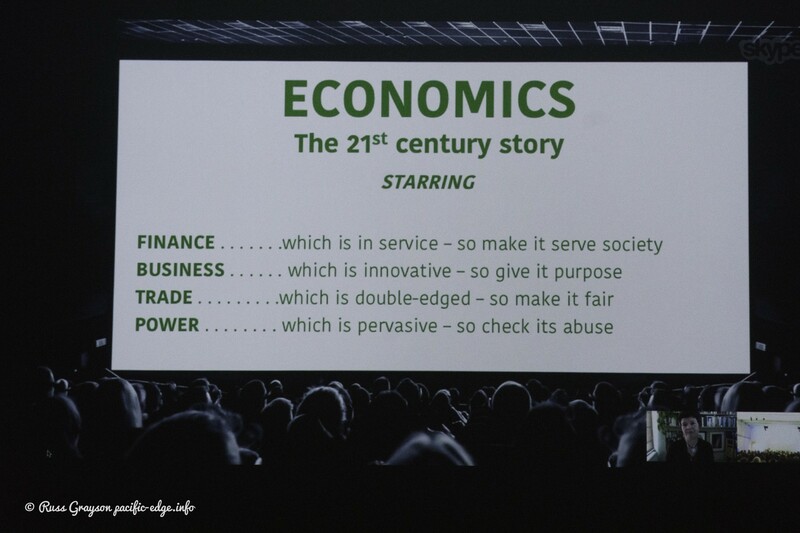 That economic focus slowly drained from permaculture over succeeding decades, partly due to social economics taking on a life of its own through organisations like TOES — The Other Economic Summit started by architect, Michael Burnley — partly to a stronger focus on domestic food production and energy efficiency, partly to the interests of new people coming into the movement. It didn’t completely disappear. Permaculture educators continued to teach LETS in their design courses. 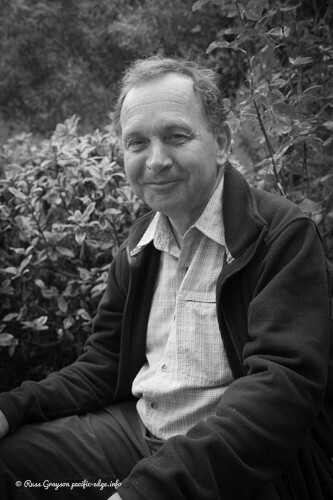 A pioneer of economics in permaculture, Robert Rosen was one of the people who started permaculture’s Earthbank in the 1980s. Earthbank was established to support the then-emerging social investment or ethical investment movement. Step forward a few decades and step into the New Economy Network Australia’s first conference that filled Glebe Town Hall with around 250 people in September of 2016. Look round and you might have seen a few people from that early surge of economics in permaculture, people like Robert Rosen and Shaun Turnbull. But all those other people? They were new and none knew of permaculture’s role in pioneering the new economics in Australia. With its capacity to attract hundreds to its gatherings it is clear that the idea of a new economics is taking root. It attracts a broad diversity of people spanning community economics interests, those working in the digital economy, co-operatives, academics and others engaged in social enterprise start-ups. 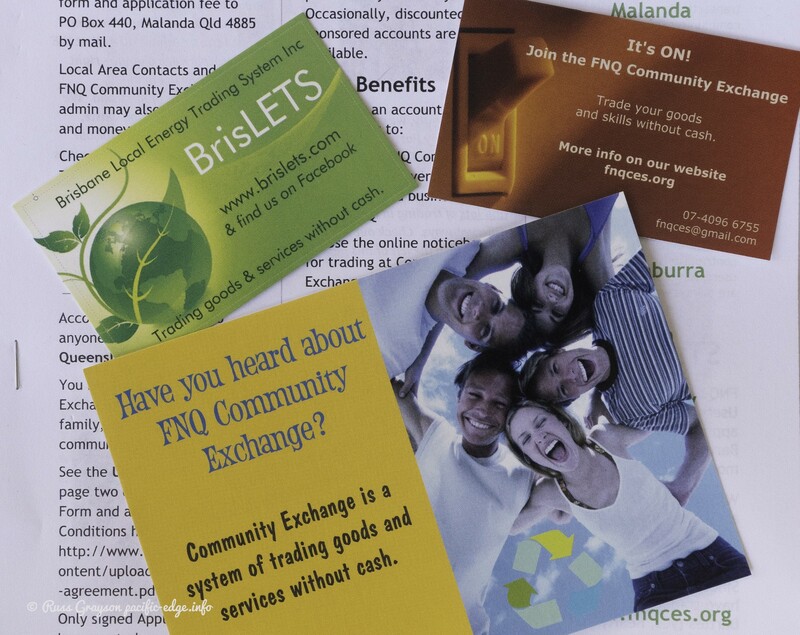 BrisLETS, the metropolitan-wide LETS system in Brisbane, issued a one-day currency for the LETS trading day at the New Economy Network Australia’s 2917 national conference. What is emerging from this drive for a new, better economy for Australia that is evident in the New Economy Network and beyond? a realisation of the value and practicality of peer-to-peer collaboration, co-operation and sharing. The strong interest in food and food systems at the Brisbane conference was largely absent from the previous year’s Sydney conference. The presence of people from Brisbane Food Connect and others active in food system issues, such as Sustain’s Nick Rose from Melbourne, stimulated discussion around food issues. The breadth of interest in this idea of a new economy offers a parallel stream compatible with permaculture. Both are based on the knowledge that contemporary capitalism is fading but that the old solutions like big-state socialism offer little by way of a community-focused and adaptable future. ‘Commonwealth’, because that suggest the holding of a nation’s wealth a a common property of its citizens, rather than being corralled into the hidden coffers of a numerically small economic and political elite; it is a fairer and better way of creating opportunity and doing economics. So, how does the permaculture movement build bridges with the new economics movement? What are our commonalities where we can work together? That’s the challenge now.